But, don't despair if you're not rich and famous, yet. There are plenty of chains and stores that want to be seen in Ginza that don't necessarily charge much at all and one can even eat on a modest budget many places in Ginza. Strolling through Ginza on a weekend afternoon when they close off vehicle traffic on Chou-dori is not to be missed. 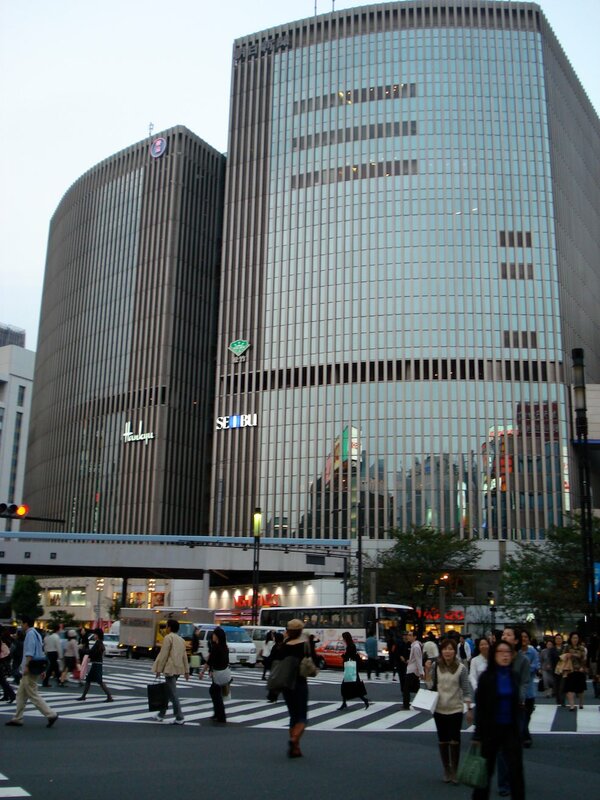 The Ginza Wako building and its distinctive early modern architecture is a symbol of Ginza. The building and its clock tower were completed in 1932 and are at the intersection of Chou-Dori and Harumi-Dori. 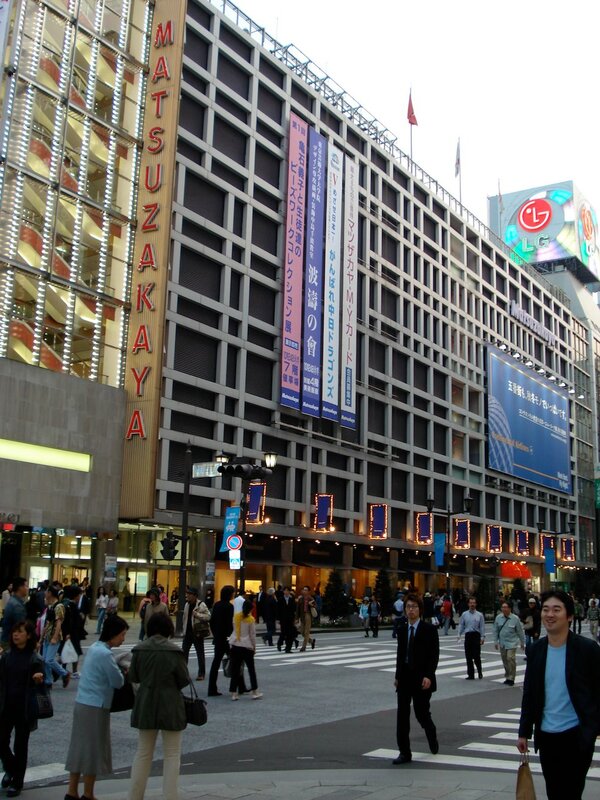 Mitsukoshi is an international department store with buildings in major cities around the world. 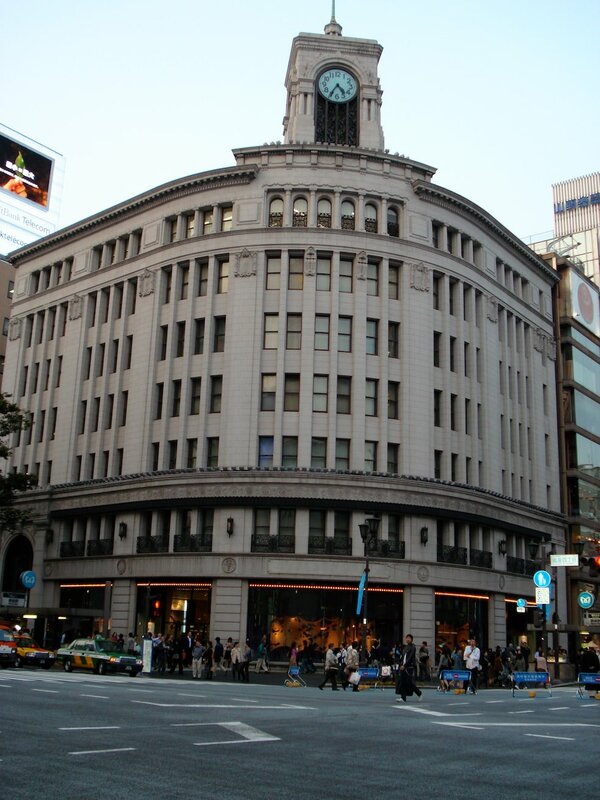 The Ginza store was built in 1930. This famous Japanese company's head office is in Nipponbashi in Tokyo. Its history stretches back to 1673. Matsuya is not a major chain like most department stores in Ginza. But, its store was finished in 1925 and that makes it one of the earliest. The only other Matsuya is in Asakusa. Matsuzakaya is a large Nagoya based department store chain. It was established in 1611 which makes it one of the oldest in Japan. 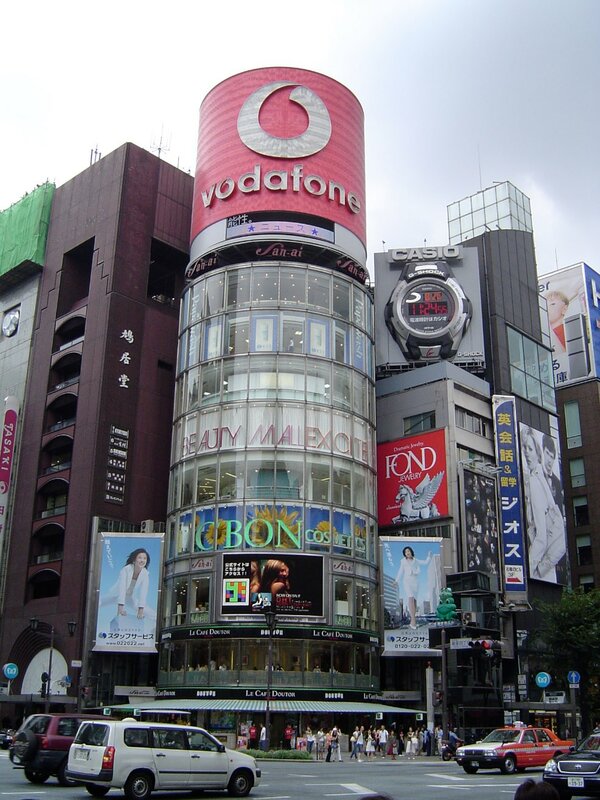 The Seibu and Hanku department stores are both in Marion Building which is split in two by the main route from JR Yurakucho Station into Ginza. Hankyu also runs Mosaic with smaller lifestyle stores south of the Marion Building. Printemps is a Paris based department store that opened its Ginza store in 1984. 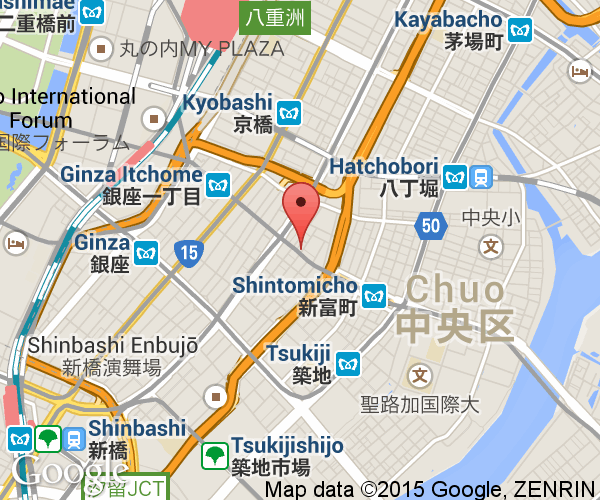 The store is located a bit away from the others to the north up Sotobori-Dori from Seibu. The parent company also owns Gucci. Ginza's boutiques are mostly on Chou-Dori and along the streets on the Yurakucho Station side. 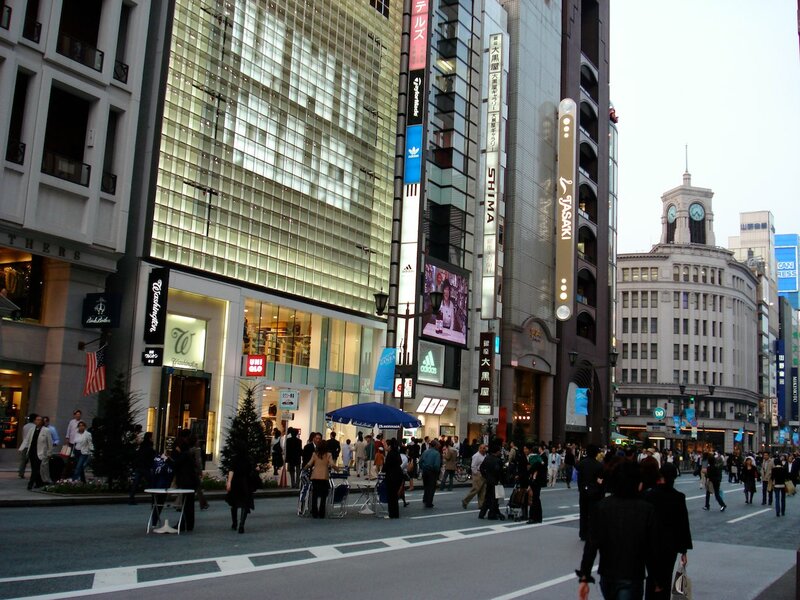 Most of the world's famous fashion brands are on the main streets of Ginza. But, the trendy stores on the smaller avenues are where to find the true Ginza shopping experience. 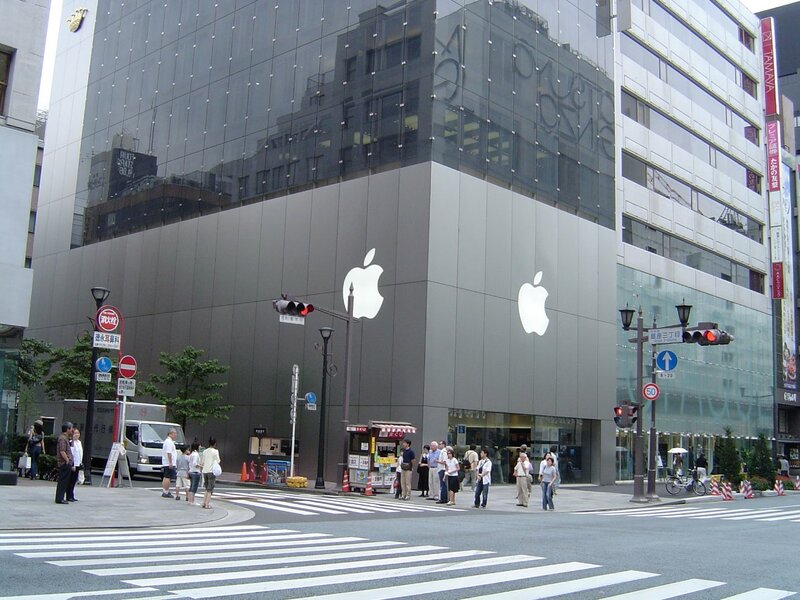 The Ginza Apple Store is one of two in Tokyo and is located along Chou-Dori near Mitsukoshi. Apple shunned Akihabara for Ginza and it fits perfectly. Open 10:00 - 21:00. Sony, Japan's leading electronics maker, has all their top brands on display here. The Sony showroom is a mecca for international Sony fans. The gallery-like setting is unique but the building gets crowded quickly. Closed on New Years. The traditional theater style of Kabuki is alive and well in Ginza at Kabukiza. Afternoon and evening shows are put on almost every day. Tickets can be bought to see the entire performance or to see just an act (3 to 4 total) which lasts about an hour. English earpiece guides are available. The theater is the best place to watch Kabuki in Tokyo. It is located past Chou-Dori on Harumi-Dori. 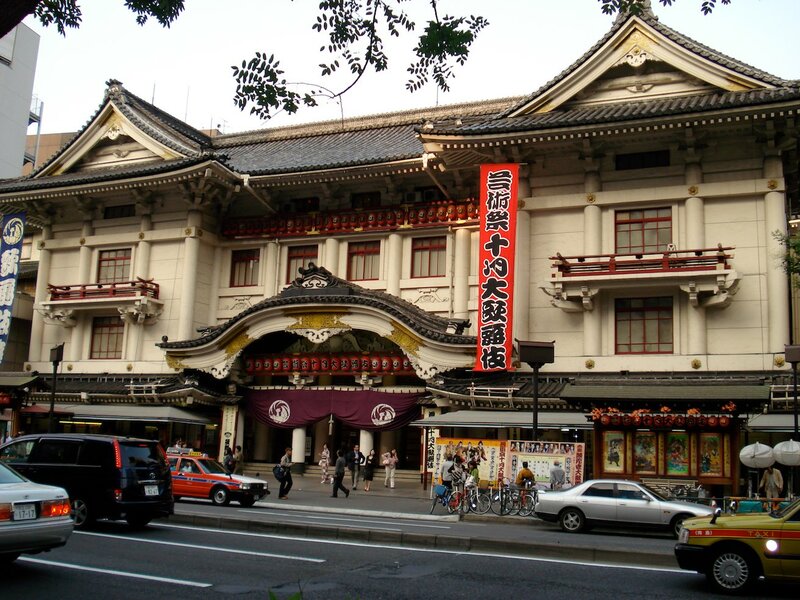 Traditional Japanese theater is showcased at the Shinbashi Enbujo Theater. Shows rotate in and out every month or so. This large 1,428 seat theater is located south of Kabukiza. Takarazuka Theater was established in 1913 in Hyogo Prefecture by the president of Hankyu Railways. He created a style of theater where young women play all the parts in western-style productions to boost his business. In many ways, it is the opposite of Kabuki. The Tokyo theatre was originally built in 1934 as a second stage for their productions. It was destroyed in 1998 and rebuilt in 2001. It is located on the opposite side of the tracks as Ginza to the south of JR Yurakucho Station. Kachidoki Bridge is a symbol of Tokyo. Kachidoki Bridge last lifted its double spans on November 29, 1970 but Tokyo residents still have fond memories of the days when it opened daily to let the freighters up the Sumida River. Tsukiji Market is Tokyo's largest wholesale market that is most famous for its fish market. Buyers from restaurants and stores come here to purchase the fish that ends up on Tokyo's dinner plates. Ginza is a short walk from JR Yurakucho Station on the Yamanote Line. From the station, take the east exit and walk through the Marion building with the Siebu and Hankyu department stores. There are several subway stops that are right in Ginza. The Ginza Stations on the Tokyo Metro Marunouchi Line, Hibiya Line and Ginza Line all are in the heart of Ginza. The Toei Asakusa Line stops near Kubukiza at Higashi-ginza. Finally, the Yurakucho Line has a stop in the nothern part of Ginza.